The DynoLab® On-Board Dyno™ offers a convenient and inexpensive alternative to the traditional methods of measuring Horsepower. Unlike engine or chassis dynamometers, the On-Board Dyno™ is installed directly in the vehicle and Horsepower is measured while actually driving on the road or track under real-world conditions. 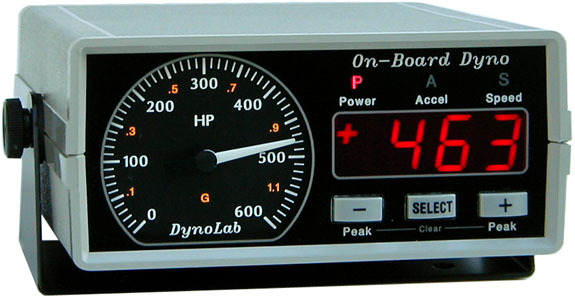 The On-Board Dyno™ is a precision instrument with an accuracy of +1 percent. It is often more precise than expensive engine or chassis dynamometers. Models are available with full-scale ranges of up to 2000 Horsepower. In addition to Horsepower, the instrument will also measure Acceleration, Deceleration, Speed, Frictional Drag, and Aerodynamic Drag. With the use of a laptop computer and DynoLog™ software, test runs may be recorded, graphed, and analyzed. The software also allows the display of RPM, Torque, Elapsed Time, Time to Distance, and many other engine and vehicular parameters. The installation of the On-Board Dyno™ is simple. No connections to the engine are required. The small size of the instrument allows for dash mounting and it can be easily moved from car to car. 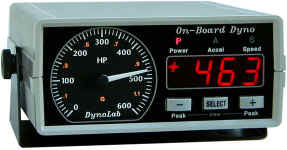 The cost of the On-Board Dyno™ is very low when compared to engine or chassis dynamometers. At only $1495 for the complete system, the On-Board Dyno™ now allows many racers and auto enthusiasts to own their own dynamometers. And this ownership is risk free. The On-Board Dyno™ is covered by a One Year Warranty and a 30 Day Unconditional Money Back Guarantee.